Today we’d like to discuss one of the most effective – and inexpensive – ways to deter crime in any community. This is with a neighborhood watch. 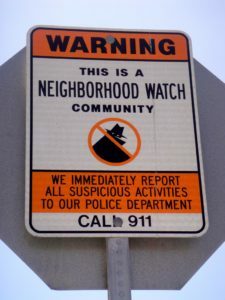 Also known as a block watch, town watch, apartment watch, and/or a crime watch, these neighborhood associations look out for each other’s homes, families, businesses and community buildings and alert the police to any suspicious activities or crimes in progress. First, meet with a small group of neighbors to discuss the watch concept and gauge their level of interest. Is this something the neighborhood wants or needs? What are the possible challenges? Then hold a neighborhood-wide meeting to discuss the program. Once again, you’ll need to figure out your neighbors’ interest level, talk about the purpose of program, and work to identify any issues that will need to be addressed. If your neighborhood decides to start a watch, ask for block captain volunteers. They will be responsible for communicating with members on their block and keeping up-to-date info on residents. Establish regular meetings and communications with members. This can be over email, phone, newsletter, etc. Prepare a neighborhood map. It should include names, addresses, and phone numbers of participating households. Distribute copies to your members. Post neighborhood watch signs. When you’re ready, check in with law enforcement. They may be able to provide signs or tell you where you can order them. The watch concept is adaptable. It can be organized around any geographic unit, from a school or park to a neighborhood. Be as inclusive as possible. Make sure to include the elderly, working parents, young people, and folks with disabilities. Continue to work with law enforcement. Invite an officer to attend one or more of your meetings. Ask for help with training, how to report crimes, and tips for better home security. Do not assume the role of the police. All you and your neighbors need to do is be alert, observant, caring and to report suspicious activity or crimes immediately to the police. Denalect Alarm is proud to serve home and business security and alarm systems in Northern California: Antioch, Blackhawk, Concord, Danville, Dublin, El Cerrito, Hercules, Lafayette, Livermore, Martinez, Moraga, Oakley, Orinda, Pittsburg, Pleasant Hill, Pleasanton, San Ramon and Walnut Creek.